As Louise said last week, we are both ‘beginner Buddhists’ and these study nights are invaluable to our first steps along the right path. Again, Vidyadasi led this group and held the space really well. I feel like a lot of my questions were answered! How do we know that this is the idea state for man? Where does the idea of Enlightenment come from? Traditionally, Enlightenment is said to consist of three main things. Firstly, it is a state of clear, pure awareness. Some schools of Buddhism claim that within Enlightenment the subject/object duality is no longer experienced, that the Enlightened one sees no difference between himself and others, between ‘out there’ and ‘in here’. There is just awareness. This awareness is an awareness of things as they really are, which is seeing all things clearly and truly, without the delusion, obscurity, prejudice and mental conditioning that all humans experience the world through. It is direct spiritual vision of the reality of our existence, also referred to as a state of knowledge, or an awareness of Reality. Secondly, Enlightenment is referred to as a state of intense, over flowing love and compassion. It is often compared to the love between a mother and child, as in the Metta Sutta, ‘the Discourse of Loving Kindness’, which says ‘Just as a mother protects her only son even at the cost of his own life, so should one develop a mind of all-embracing love towards all other living beings’ . The attitude is one which the WBO endeavors to cultivate, the Metta Bhavana, (Metta meaning lovingkindness and Bhavana, meaning cultivation or development) being one of the two key meditation practices within the movement. This lovingkindness is not just directed towards human beings but towards all ‘living’, that is, sentient beings and also manifests itself in a deep desire that all beings should gain Enlightenment, thus being set free from all their suffering. Thirdly, Enlightenment is also described as a state or experience of ‘inexhaustible mental and spiritual energy’, and ‘a state of uninterrupted creativity’. It is an experience of perfect freedom from all the conditioned limitations which humans construct for themselves, such as attachment to the self, hate, expectations, attachment to others and many more! Through I have attempted to describe Enlightenment in these three aspects, in reality Enlightenment cannot really be put into words or confined into definitions. It is a constantly shifting combination of all of these aspects; knowledge passes into love and compassion, passes into energy, passes into knowledge and so on and so on. This description can only give a hint or explore a tiny fraction of what Enlightenment truly is. In short, Enlightenment is a state of supreme knowledge, love and compassion and energy. Within us all are the seed of enlightenment; we all have love in our hearts, and feel compassion for others, we all have some experience of Reality, we all have some energy. We already have enlightened qualities within us, and it is this that shows us that Enlightenment is the ideal towards which we should aspire. When we feel love and compassion, when we are tackling a project with creative energy, when we are able to rise above our conditioning and start to see things as they are, we feel a serenity which is missing from our everyday lives. This is our glimpse of Enlightenment. Within Enlightenment these qualities are developed to a degree that we can hardly understand, but it is our possession of these qualities, however slight, that gives us a natural affinity with the idea of Enlightenment, and the ability to achieve it. When Enlightenment is talked about, when love and compassion, energy and Reality are talked about we can feel something, we can feel a connection to them, the seeds are within us already. We can tell that Enlightenment is the natural ideal for us too because nothing else can satisfy us. No matter how many things we own, how much money and material safety we have, how many achievements we obtain, there is something within that is not satisfied, that can only be satisfied by seeing the truth of things. This feeling of unsatisfactoriness is called, in Buddhism, dukkha. There are three forms of dukkha. The first is ‘the suffering which is suffering’, this is when, for example, we cut our finger, or if someone disappoints us. The next is ‘suffering by way of transformation’. This is when we obtain something, get pleasure from it and then lose it. because we have become attached to it, we suffer when it is gone. This suffering comes about as a result of change and time. Lastly, there is ‘the suffering of conditioned existance itself’, which is the suffering of everything which is not Enlightenment. The ideal of Enlightenment comes from us from humankind itself, from the ever present struggle to understand ourselves and the suffering we live with and to rise above it. We struggle to grow, to develop, but to do this properly, we need an ideal to consciously aim towards. For us, growth means a growth in awareness, of ourselves and of our surroundings and the ideal of Enlightenment gives us direction. In the extract from ‘The Ideal of Human Enlightenment’ by Sangharakshita which we used for the study and from which all quotes are taken, he says that ‘if we look back in history we can see various people who have actually achieved Enlightenment.’, however, he doesn’t name any, and after searching the internet I found no concrete names of people who are Enlightened now. This raises some interesting questions for me, such as, if part of being Enlightened is a deep desire for others to gain Enlightenment then surely you would reveal yourself to be Enlightened and try to teach others like the Buddha did? Revealing yourself to be Enlightened would be key to this as it would make teaching people and bringing them closer to Enlightenment easier as they would give more weight to your words knowing you were Enlightened. The fact that I couldn’t find any information about Enlightened people now raises doubts in the rational part of my mind, but I still feel very strongly connected to the ideal of Enlightenment, and do connect with it spiritually as something to aim for. I think that I need more discussion on this part of the subject! Having been brought up as a Jehovah’s Witness my tendency is to think in theistic terms, that is, in terms of a god who has created the universe and who governs it. This is not so useful when looking at Buddhism, as the Buddha was a man who, through gaining enlightenment, woke up and began to experience reality as it truly is. 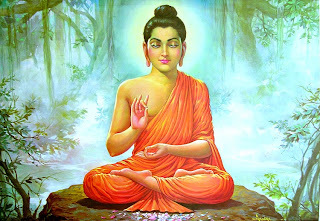 The very word ‘Buddha’ means ‘he who is awake’. The emphasis on the fact that Buddha started life as an ordinary man really helped me to start to see Enlightenment as something attainable. I began to see that the Buddha was an extra-ordinary man, one who surpassed his conditioning through his own efforts, and thus, becoming a Buddha was something I could do too – I’m not sure about my chances in this lifetime though! Beginning to see the Buddha in evolutionary terms, as the next stage of man, has helped me feel a deeper connection to Buddhism. Due to my upbringing and subsequent rejection of the Jehovah’s Witnesses Faith I have a unconscious negative reaction to religion and the idea of god, and have found that this has been holding me back somewhat in my learning. Seeing the Buddha as the next stage of evolution of man, along with other things I have learned have helped me start to overcome my resistance. This entry was posted in Development, Study by Ruth. Bookmark the permalink. I loved your post regarding Enlightenment and just wanted to offer you a few perspectives. It is very difficult to speak about Enlightenment as the Expereince is of Unspeakable LOVE. Enlightenment is not expereinced in the realm of perspective which is where we speak now, but in the realm of Knowledge. Imagine trying to describe the most Intense moment of Love and then multiplying it by a Billion and then someone asks "What is it like" ……It is impossible to describe. So why dont those who have "awakened" speak of it. Often the way to speak it is best demonstrated by being it…..words can help however but in some ways a smile or act of gentleness can say so much more. Once you have the Experience you will also realise the power of thought, and that correct thinking does more to help you and all others that speaking or actions. Truth is those that are Enlightened do speak it but often the best ways have already been written and thus it is usually easier to point to a dharma or other teaching rather than construct yet another teaching which often is used because of misentepretations to divide us. I assure you we have no need of further new teachings. The other reason is simply to speak Truth is to speak from the Enlightened state and that can often be quite incomprehensible to those who have not yet Experienced. What is spoken appears upside down and backwards when compared to what is spoken in this world. It is in an Enlightened beings Self interest (no there is no self but this is the only way to explain so look past the apparant contradictions ;))…..to help all others to Enlightenment and after Enlightenment that is the only "Purpose" , yet that must be achieved without the other being brought further into fear which is difficult because mans thought system is opposite to the Enlightened beings thought system and thus what is said could be seen with fear rather than an aid to the path of LOVE……There is nothing to fear in fact…. but that is not always apparant to those still to awaken. I speak about it and offer to speak to anyone who would listen………..although I tend to reference lots of teachings including Hindu, Buddha, Bible, ACIM, Rumi or no Religion / teaching etc etc because they all point to the same thing………although sometimes they appear to be in opposition they are not. ……although for a little time it appears there is. I will be at Buddhafield for the Festival unless i an no longer "here" hehe… and know quite a few of the volunteers from last year so if you would like a meet up or a chat thats fine….. I am not interested in being a teacher as we are all equals and it may just turn out that the child before me is my greatest teacher…..Enlightenment is certainty…..It is not the end of the journey….although it is. You may find the teaching in a book called "A Course in Miracles" to be helpful in undoing the religious doctrines as it uses the symbols of God and Jesus, but paints a very different picture of what Jesus taught and interestingly when seen from this other perspective matches the teachings of many other Eastern Scriptures and also many of the the Gnostic gospels perfectly……..but that is for you to follow or not…..no matter and no right or wrong. And for a little time ……with no attachment lol ….Buddhafield is a precious place in which we can all learn to walk again.